Without an inter­dis­ci­pli­nary char­ac­ter­i­za­tion of “immer­sion”, why do we allow this con­cept to be so read­ily invoked in dis­cus­sions of books, visual art, video games, vir­tual real­ity sys­tems and more? While “immer­sion” into tra­di­tional media con­cerns the con­tem­pla­tive dis­tance of a spec­ta­tor to another world depicted in a writ­ten novel or work of art, con­tem­po­rary tech­nol­o­gists can speak in terms of a vir­tual dis­tance which has a per­cep­tual ele­ment. If engaged in the social inter­ac­tions and per­cep­tual attrib­utes of a novel’s image-less, tex­tual world, is the reader “immersed”? Alternatively, if par­tic­i­pants enter a highly func­tional VR system, with a head-mounted dis­play, spa­tial­ized audio and haptic feed­back, but do not believe the illu­sion, are they “immersed”? The ambi­gu­ity sur­round­ing “immer­sion” is a sig­nif­i­cant obsta­cle to research­ing media which lie across lit­er­a­ture, art and tech­nol­ogy. The present dialec­tic moves from phe­nom­e­no­log­i­cal bound­aries between self, world and other worlds to the­o­ret­i­cal sim­i­lar­i­ties between “immer­sion” as dis­cussed by tra­di­tional and inter­ac­tive media the­o­rists. A uni­fy­ing char­ac­ter­i­za­tion is estab­lished and dis­cussed in the con­text of an ongo­ing project which explores bound­aries of what is con­sid­ered “immer­sive”: the Sonic Cradle, a cham­ber com­bin­ing biofeed­back, sen­sory depri­va­tion, music and meditation. Vidyarthi, K. J., Gromala, D., & Riecke, B. E. (2011). Are you Immersed? 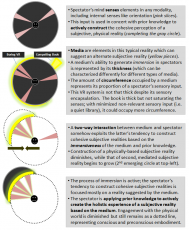 Characterizing Immersion across Literature, Art and Interactive Media. Talk pre­sented at the Society of Literature, Science and Art (SLSA) Conference 2011, Kitchener, Canada.